Saturday at Reading Festival – good weather, a headliner in Kendrick Lamar that I confess I didn’t see, plus one of the oddest 20 minutes I’ve ever had at Reading, and as always some stand out performances. Let’s start with the odd experience. There’s a lot more to be written about the way the Internet has changed musical tastes but perhaps the key point is how kids today don’t see any need to follow one particular style. They are happy to enjoy stuff from a range of genres. And so it is that Rex Orange County, a 20 year old from Haslemere in Surrey, has been feted by top US rap artists, while his own work is mainly well constructed, traditional, even old-fashioned popular songs that frankly Burt Bacharach might have written for Andy Williams in the mid 1960s (except for the odd swear word – in the video here too). His band included trumpet, sax and flute, adding to that easy listening vibe. And yet, back to the weirdness … I have NEVER heard such loud audience singing as 10,000 youngsters yesterday in the Radio 1 tent seemed to know every word of most of his songs – and clearly love the songs, of course. Very, very strange, but in a good way. You can get a sense of this from the BBC video. The best sets of the day? The Magic Gang were excellent twice, doing the “mystery set” on the Introducing stage then a late evening set in the Festival Republic tent. Tuneful indie pop, with touches of the Beatles and Beach Boys at time, and you feel they have some more complex songs waiting to emerge too. Once upon a time, Dua Lipa would have been bottled off at Reading based on the fact she is not “rock” by any stretch of the imagination, but yesterday she got as big a crowd as anyone. Certainly from the back of the arena area, the sound was awful though – tinny backing apart from an unpleasantly resonant sub-bass. I know the kids like that sort of thing, but when you’re not focusing on her strong songs because you feel like someone is pulverising your kidneys from the inside, it seems counter productive. In fact is it amazing to think that Panic! At The Disco got the bottle treatment about 10 years ago supposedly for being “a bit EMO”. This year, the band is positioned as co-headliners with Kendrick L and they certainly came over that way, with a brass section, violinists, powerful lighting and even a few fireworks. They have quite a library of songs to choose from and High Hopes is currently giving them their biggest “hit” for many years. Good stuff and a good crowd, although Lamar probably had a bigger crowd as he drew more of the youngsters back from their dinner and preloading in the campsites. On the Panic! theme, I Don’t Know How But They Found Me was ex-Panic! Bassist Dallon Weekes in his new format – with just a drummer (Ryan Seaman) and some backing tracks. 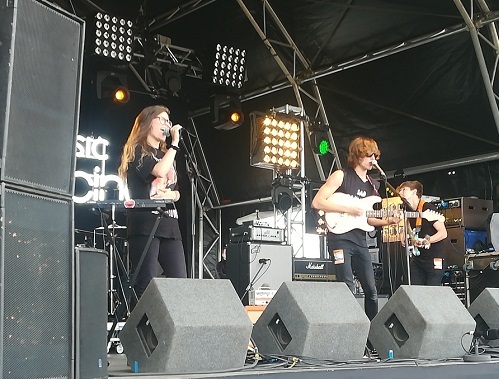 But they were excellent with quirky, catchy, tuneful synth-based pop-rock that looks like it will put him right back in the public eye – a highlight of the day for us. Finally, a word for the good work the BBC does with their whole “Introducing” programme. I saw five acts on that stage yesterday, all very good – Russo, the Snuts, the Dunts , Bessie Turner and the standout Brand New Friend (pictured here), from Northern Ireland, with their lively, catchy indie-pop tunes. Well, we are heading off in an hour or two, dressed for one of the wettest Reading days ever, if the forecast is to be believed. Wish us luck - I’m not sure we will see it through to the (soggy) end though …!